Reese’s new candy bar, which as far as I know, isn’t limited, was recently released. There was a heavy marketing blitz behind this, which leads me to believe it will be around permanently. 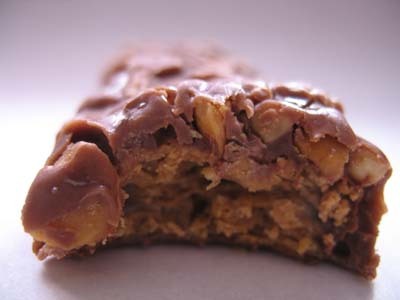 This bar, which is about the size of a Snickers, features chocolate, crispy peanut butter candy, creamy peanut butter, and chopped peanuts. As I had guessed, the crispy peanut butter candy is similar to the filling inside of a Butterfinger, but not an exact match. The inclusion of peanut butter, as well as the peanuts, give the bar a different taste and it didn’t get stuck in my teeth like Butterfingers always do! The chocolate was a bit of a disappointment though. It had a tacky quality and felt like it was almost at the melting point, even though it wasn’t anywhere where it should be melting. Maybe this was an isolated incident though. Overall, I thought the bar tasted very good. The addition of the peanut butter was very nice in combination with the crispy peanut butter candy. I would definitely pick this up again, and considering all the TV commercials I’ve seen for it, I’d imagine that Reese’s is hoping you’ll pick it up too. I also saw the commercial for these a few days ago. Glad to hear they’re tasty. I’m a big fan of peanut butter candy bars, so this sounds right up my alley. Oh, BTW, how does this compare to the Whachamacallit? CRACK!! This stuff is pure crack. I don’t watch much tv so I was not aware that this bar existed, until I paid a visit to the vending machine at work. I have always been a fan of the Reese’s Peanut Butter Cup so when I saw this bar my first thought was “I have to give it a try”. And I’ve been hooked ever since. I have had one everyday for the last two weeks. The crunchy filling is absolutely delightful. I have to admit that every one I have tried felt like it was about to fall apart. The chocolate leaves me with the impression that it had melted and only partially reconstituted: fragile is the word. I didn’t actually like this candy bar. I couldn’t eat all of it. I like the nutrageous bar better. I got some of these for Valentine’s day. They are way too sweet. I could only eat a few bites at a time and I really did not enjoy it. Nutrageous is a lot better because you can actually taste the peanut butter inside and it’s a bit salty too. I was never a fan of hershey’s until I tried this (never saw the advertisements, it was on sale and thought I’d give it a try). Ever since i can’t help myself. I spent about $50 on this last month and 50 more hours at the gym but it was worth every penny / minute.